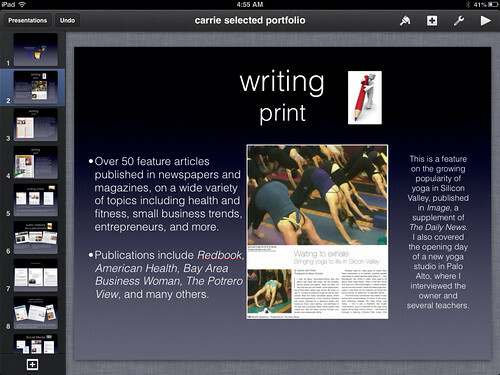 I was exploring Keynote for the first time today, as I am still shopping around for the best slideshow platform. The good news is, I found the program fairly intuitive, with a lot of drag and drop functionality, and great text feature options for fonts, colors, and effects. You can easily reorder slides by tapping where you want them in the slide sorter, and you can choose templates that provide helpful grids for slides and text. Animations and transitions are similar to those used to Powerpoint, with a variety of special effects to choose from. One feature that's not so obvious is hyperlinking text, photos, and objects. Of course, I knew there was a way to do it and I was certainly not going to give up, so you shouldn't either! When I started researching this online, I saw there was a fair amount of confusion about it, but once you get the hang of it, like anything else, it seems easy. So to set up the link, click on the photo, object, or text. Then, click on the toolbar icon on the upper right, and select "Advanced." A pop up menu allows you to select which slide you want to link to, with a choice of a website URL or an email address. Fill in the site or email address, and click DONE. When you return to your slide, you'll see that your selected image now shows a blue arrow, and when you play your slide show or even test your slide during editing, it will link to that URL. One note of caution: if you rearrange the images a lot, or do any major editing, be careful that the links still work correctly. I found I had to redo some of the links after I had saved the document as a PDF. So give it a try, and happy linking. PS I noticed once I had saved to PDF format, I could choose to open the file on my iPad in iBooks, and I loved the document flow and feel, certainly user friendly and probably great for e-books. 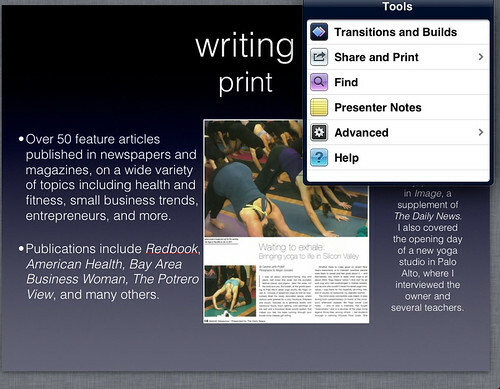 Has anyone tried using Keynote for book formatting? Share in the comments.